Hello everyone, welcome to another exciting post on my home and garden blog, Xephon. I am super excited to have all of you lovely readers joining me today as I have what I think is a very interesting post for you. Over the past couple months, I have been scouring garage sales and online for sale ads to find kitchen gadgets and appliances that were first shown on TV. I ended up with a box full of them thanks to a lovely lady on www.used.forsale that sold me the whole box of them! I put them all on the counter and tried them out one by one so that I could pick the best one for you to buy if you are looking to get some kitchen gadgets or appliances off of the television. I will admit, when I first saw the Magic Bullet on television I thought it looked like a piece of junk. After using it for just a couple minutes however I realized that this little thing is the real deal. It chopped up nuts for a cake in 15 seconds, and made a smoothie in 30. I ended up looking for another Magic Bullet for sale on http://www.used.forsale/magic-bullet-blender that I gave to my son who is at university. He doesn’t have room for a big blender mixer like I’ve previously posted about so the Magic Bullet is perfect for him to use in a variety of ways, plus all the add ons and extras are relatively cheap. I never saw the appeal to buying a George Foreman grill when you could get one that is just as good, if not better, from an outlet store. After finding a pretty one for sale at http://www.used.forsale/george-foreman-grill I thought what the heck let’s try this out. I made a meatloaf for me and Frank with it last night and he actually complimented me on the meatloaf! He hasn’t done that since before we were married! I looked around online and found a great list of George Foreman Grill recipes so tonight I will be cooking up some salmon so I can fish for compliments again. Those are the only two gadget/appliances that I tried out and was blown away by, but there were plenty ‘good-enough’ ones that I would recommend for certain people. If you love you knife like me (as you can tell from my post about knife sharpening) then I would suggest trying out the Edge of Glory knife sharpened. You place it on a surface and then use the two blades in the middle to sharpen your blade. 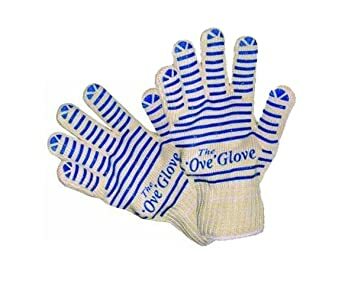 Also the ‘Ove Glove, which is really good at keeping the heat out but also keeps your hands insulated. Those are my suggestions for the best as seen on TV products for your kitchen; the Magic Bullet, the George Foreman Grill and if you want to spend a bit of extra money the Edge of Glory sharpener, and the ‘Ove Glove. I hope you all enjoyed this post and that it helps you pick out the gold from the grime next time you see a product for your kitchen on TV. Talk to you later folks.